Despite the growth in popularity of MEMS tilt sensors, electrolytic tilt sensors remain a standard for industrial applications, as Shawn Orr, engineer at The Fredericks Company explains. Due in part to their widespread use in commercial applications, MEMS tilt sensors and accelerometers are more prevalent and often more easily recognized by designers and consumers. Despite this fact, electrolytic tilt sensors have continued to show significant growth in popularity for industrial applications in recent years. Some of these applications include construction vehicles, construction tools like laser levels, RV (recreational vehicle) leveling, mobile satellite positioning, and geophysical and structural monitoring. In these applications, product lifetimes are measured in years, not months, and sensor accuracy is crucially important to the end-user. It’s also critical for this accuracy to be maintained for as long as the end-user’s product remains in the field. Accuracy is the most important performance metric for any tilt sensor, which most manufacturers specify by combining several specifications including, but not limited to, repeatability, drift, linearity, and performance over temperature. There are considerable differences in the accuracy, and more specifically the repeatability, offered by off-the-shelf commercially available MEMS tilt sensors when compared to electrolytic tilt sensors. Lower-cost electrolytic tilt sensors can offer anywhere from ±0.001° (±5 arc seconds) to ±0.1° repeatability, while higher end electrolytic sensors achieve sub-arc second repeatability. This extreme accuracy is only offered by the highest-cost MEMS tilt sensors, which often also require multiple expensive supporting components, adding even more to the total cost of the end product. Small voltage variations can have a significant effect on the accuracy of MEMS tilt sensors. Specifically, they can cause drift over time and temperature which can result in the need for sensor re-calibration. To achieve optimum performance, highly precise and stabile (and high cost) voltage supplies must be integrated into designs that use MEMS tilt sensors for high accuracy or industrial applications. In comparison, the ratiometric measurement principle used for electrolytic tilt sensors makes them much less susceptible to voltage variations and allows for the use of lower cost power supplies. Another factor which can significantly impact the performance of a tilt sensor is its environmental durability. Here, MEMS tilt sensors can be constrained by their packaging options and temperature ranges. Off-the-shelf electrolytic tilt sensors, by comparison, offer an operating temperature range of -40 °C to 85 °C with storage temperature ranges reaching -55 °C to 125 °C and come standard in a hermetically sealed package. Another way environmental durability can affect the performance of MEMS tilt sensors over time is through changes in material properties. If you simplify the design of a MEMS sensor and think of it as a spring with a proof mass attached to it, as the spring moves over the life of the sensor and is exposed to shock, vibration, and temperature extremes, its spring constant will change. Conversely, electrolytic sensors contain no moving parts and therefore do not exhibit any performance degradation due to shock, vibration, or temperature extremes over time. Packaging and mounting options for electrolytic tilt sensors include a few different options, some which can be soldered directly to a PCB and others that can be mounted externally and cabled to a PCB. The availability of through-hole mounting provides a rugged connection and makes it easier to guarantee alignment of the sensor which can be more challenging with a surface-mount MEMS tilt sensor package. There’s a common misconception that electrolytic tilt sensors are hard to integrate into a design than MEMS tilt sensors because electrolytic sensors require AC components for an AC drive signal. 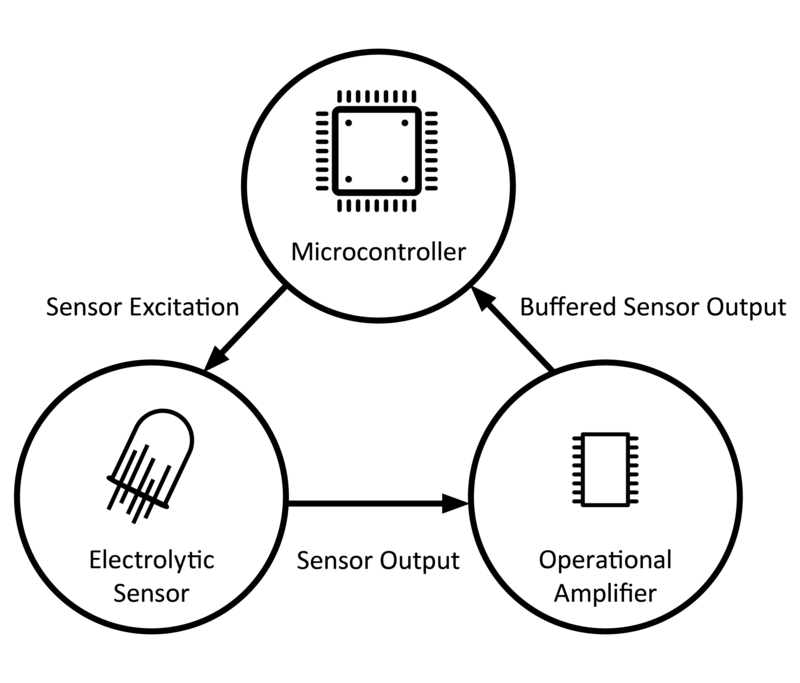 The reality is that an electrolytic sensor can be integrated with all DC components, including a microcontroller (which is already present in most modern designs) and an op-amp with a few passive components including resistors and capacitors. Electrolytic tilt sensors have been in widespread use since at least the 1960s, with manufacturers like Fredericks continuing to innovate and improve this already well established technology in the 21st century.